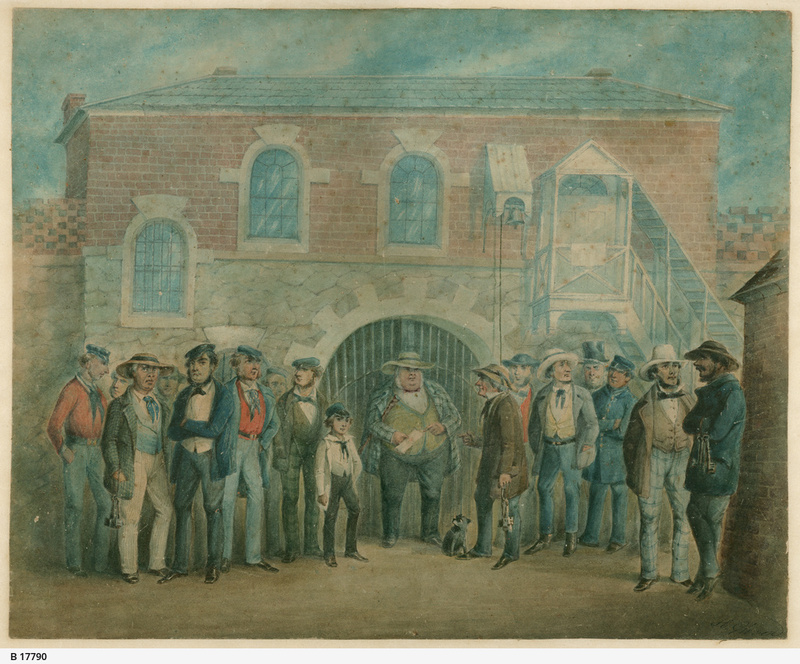 Governor and staff at Adelaide Gaol; watercolour showing the courtyard of the Adelaide Gaol, with the Governor (W. B. Ashton), his son (A. G. Ashton as a boy) and staff. See also 'Visions of Adelaide 1836-1886' exhibition catalogue by Tracey Lock-Weir, Art Gallery of South Australia, Thames and Hudson, Victoria, 2005. Henry Heath (Harry) Glover, ca.1810-1858, no relation to artist John Glover. Glover died on 2 March 1858 age 48 at Adelaide, South Australia. He was a painter and lithographer in England then victualler and publican in South Australia. The Governor's young son, A. G. Ashton or Albert Gawler Ashton, was born (to quote his father) 'in the cottage behind Government House' on 4 February 1841 and christened at Trinity Church on 1 April 1841. He is said to have been his father's constant companion. Until his death the painting hung in A. G. Ashton's home and he told his children that it was he who was portayed with his father. William Baker Ashton's own record of his children can be found in his private papers [PRG 83] and Albert's christening is recorded in Trinty Church records.